Yucky Worms by Vivian French, illustrated by Jessica Ahlberg. (Grades K-3.) Candlewick Press, February 2010. 29 pages. Review copy provided by publisher for Cybils consideration (this review reflects only my own opinion). Who knew that a book about worms could be so darned cute and interesting? Vivian French and Jessica Ahlberg have paired up to make it happen. Our story starts as a young boy is helping his grandma in the garden and she finds a worm. "Yuck! ", he says. "Throw it away!" Grandma does not throw it away, but proceeds to tell him why worms are basically awesome. Worms not only help put nutrients back into the soil, but their tunnels allow air and water to get down to plants' roots. As Grandma's explaining this to her grandson, we see a cutaway of the worms moving below the soil, completely with additional wormy facts and cute commentaries from the worms themselves. Illustrations include the anatomy of a worm, a cutaway showing worm tunnels underground (easy to see how they help plants get water and air), and a picture showing worms gathering deeper underground when it gets cold. Funny little details make the illustrations interesting and humorous. One of my favorites is a spread where Grandma's telling about the worm's many predators and the picture shows a mole holding a shopping list that reads: "Shopping List: Worm, Worm Worm, Worm". Included in the back of the book are tips for observing and experimenting with worms (including a reminder to be respectful, as worms are living creatures). This is a great choice for kids who love bugs or for anyone starting a garden. Worms are definitely not yucky here, and this information-packed book provides a super introduction to these "underground farmers". 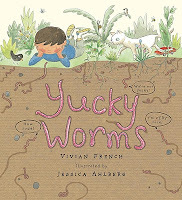 Yucky Worms is on shelves now! Happy Nonfiction Monday! Check out this week's roundup over at The Reading Tub!